On a road trip, it is often the unexpected attraction that exceeds the more famous ones. When you see an iconic sight, even for the first time, it is as if you’ve seen it before, because of pictures, but with the unexpected attraction, it is all new. Such was the case one afternoon on our Utah trip last summer. We had pulled up stakes that morning in Moab and were driving across the state to Zion, by way of Capitol Reef. 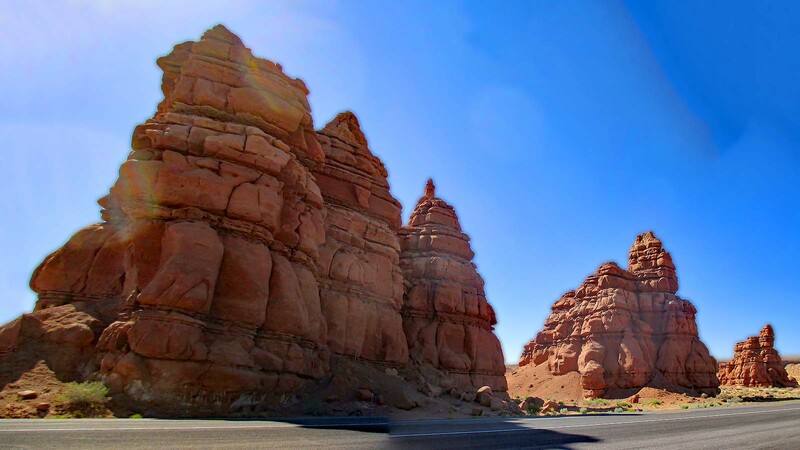 On the way to Capitol Reef, we passed the cutoff to Goblin Valley State Park. There were some roadside plaques there. Even though we had miles to go, we stopped. Soon afterwards, a young German couple pulled up in their rented VW. Like us, they were touring the West. We all must have been on the road long enough that some social contact with someone other than our spouse was needed. We ended up standing there by the side of the road, talking to each other for a while. We had a nice visit. It all made for a totally delightful, unexpected roadside attraction.